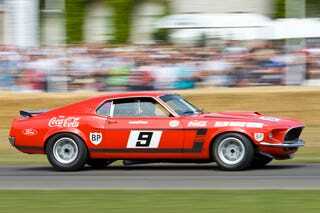 Tony Danza has nothing on Alan Moffat's 1969 Ford Mustang Boss 302, seen here at the 2009 Goodwood Festival of Speed. (Hey, there was a Ford Mustang Boss 302 announcement today? Strange coincidence. - Ed.) Photo Credit: Jarod Carruthers.